The left and some on the right, in both political parties in America, have styled themselves “progressive” for more than 100 years. Progress to them is a process of history. In that process, people and peoples are transformed and can be elevated. Time and circumstance define the being of man and of everything else. This process of social evolution makes our grandest universal statements in any time not really universal, but merely products of their own time. When the Declaration of Independence says, “all men are created equal,” it understands itself to be asserting an abiding and universal fact. When it appeals to the “Laws of Nature and of Nature’s God,” it refers to laws above the authority of man and continuing without fail through all time and everywhere. Progressives understand such laws as only time-bound assertions, the product of prevailing circumstances. Early Progressives were fond of saying that those universal assertions were good things for their time, and history was made better for them, even though they were wrong at the time in their claims of being universal. They can have permanence, by this way of thinking, only if they can assume new meanings as new circumstances arise. For Progressives, we discover the real truth about these matters by a certain kind of scientific inquiry, an inquiry into history. And once we begin that inquiry, it becomes sovereign. If everything is to change, and we are simply creatures of that change, we can win our freedom by taking control of the process of change. Guided by highly-trained people, scientists and social scientists, we can direct the society to become a new society, its people a new people. The work of these scientific people is very important, perhaps even sovereign. They have a standing independent of the will of the governed, previously thought self-governing by nature. These scientists are the makers of the future, and in making the future the people are the subject of their experiments. Since the wave election last month, we have been treated to videos of Professor John Gruber, an MIT social scientist. He has been dining out since 2010 on his experience as one of the “architects of Obamacare.” He was paid, at last count, $400,000 by the federal government, and something over $1.5 million by several state governments in aggregate to practice his architecture. Now he is on video telling the story. The architects of Obamacare figured out that if they described the health care law as it was, the American people would not go for it. They are “stupid,” in Professor Gruber’s estimation. They are stupid at least in this respect: If the complex bill could be called something other than it was, then the bill could pass and people could be introduced to its wonders. They would be able to enjoy those wonders only through experience, as they lacked the intelligence to figure it out in advance. Dr. Gruber apologized when the initial video appeared, but since then several other videos have surfaced that show him saying the same thing on other occasions. This means that conversations like the ones he describes were going on among many people, apparently one of them in the White House with President Obama, at the time of the bill’s passage. And the videos of his speeches mean that there are many people, generally highly educated people, who enjoy stories like this, pay Mr. Gruber when he tells them, and respect him for his achievement. To these people, the passage of Obamacare is apparently a delightful episode in American history. Nor is this an isolated achievement. The Dodd-Frank law sets up a power in the federal government to investigate anyone and everyone who lends money to any consumer. The agency that performs these investigations gets its budget directly from the Federal Reserve, and the Congress is forbidden by its own statute, signed by the President, to inquire into the agency’s budget. This is a perfect example of a violation of separation of powers that the Constitution was written to prevent. There are many others. Now the President has legalized the residence here of several million people who have entered the nation illegally. Immigration and illegal immigration are of course tangled and difficult issues. There are so many illegals, and many of them have been here for a long time. Many of them have children, and the children are citizens under the current reading of the Constitution (there have been others). The President himself spoke about amnesty by executive order to a Hispanic group called La Raza, which means “The Race”: saluting by race and categorizing by race have reached epidemic proportions in our country. Obama was pressed by La Raza, as he has been by many others, to provide amnesty by his authority alone. He replied in his La Raza speech, “I swore an oath to uphold the laws on the books.” “Believe me,” he continued, “the idea of doing things on my own is very tempting. . . . [But] that’s not how our system works. That’s not how our democracy functions. That’s not how our Constitution is written.” Now he has changed his mind, however, and has done what the Constitution, by his previous admission, prohibits. There are many reasons why one must sympathize with illegal immigrants and their children. There are many reasons to rue the generation or two of bad policy that has admitted them here, designed and implemented by people who simultaneously failed to make the case for a wide immigration policy, legally sanctioned, that pays attention to ability to work and emphasizes the practices and beliefs that constitute the United States. But now that we have this situation, it must be resolved by constitutional processes. These are specifically contrived to include everyone in the debate and to make decisions over time, not suddenly and not partially. To circumvent those, which by his own words President Obama has said executive amnesty would do, is to circumvent the only system of self-government that we have. Of course there is a partisan aspect to all of this for both political parties. The President appeared at a gathering of La Raza because he was courting the votes of Hispanics, who are growing in number, and who vote more heavily for his party than the other. There is a well-developed and heavily-funded strategy to win a majority based in part upon this fact. That means that the President has an interest in amnesty, and so does his party. This fact reminds one of the actions of the British king, cited in the Declaration of Independence, to expand the territory of the British government in Quebec in 1774, and to give that government more control over territory previously associated with the American colonies. He gave it control of much of the Northwest Territory, eventually the subject of the Northwest Ordinance. The king was picking the constituency that he wanted, and by this means, our Founders thought, he was circumventing the will of the people. 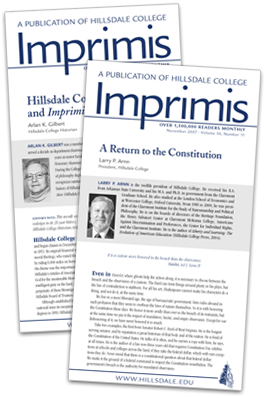 These issues are of concern to Hillsdale College for several reasons. There is the fact that we were founded, as every old liberal arts college was founded, to study the nature of man, his place in the order of creation, and his relationship to God and to the other creatures. It was organized to find the good of each kind of being, especially the human being. This work, much more than any contemporary political question, is the heart of the work of the College and its main substance. Because of this work, the College was founded in loyalty to the principles and institutions of this country. Its oldest building was dedicated on the Fourth of July, and this is one of many testimonies to this loyalty, some of them written in blood. America’s Founders believed, and the founders of our College agreed, that the regime of freedom was the best to protect the ability of each to seek his virtues, moral and intellectual, and especially wisdom and the knowledge of God. These activities cannot be commanded in detail from above. Another reason we care about these matters is because we wish to continue as we have always done, according to the mission explained in our founding document. We wish to continue to teach the moral and intellectual virtues, which include the personal, the family, and the civic virtues, and which include the pursuit of prudence and wisdom. We wish to continue to teach that the family, established in nature and established in the same way in faith, is the best way to raise children, and the raising of children is necessary to the well-being of everyone in every generation, young, middle aged, and old. And if the current political trends continue, of replacing constitutional processes and self-government with administrative or bureaucratic command and control, the activities we have continued to pursue here for 170 years will be endangered. We look back through the past and through the great books, old and new, and wonder what solution can be found to this crisis. It turns out that there are examples both of thinking and of acting that can help guide us. We require today a devotion to two things that are on the surface contrary. The first of them is constitutionalism, and the second is statesmanship. It is obvious why these do not seem to go together. The work of statesmen is only a sharp example of something we all must do daily. We hold convictions that are elevated above practical circumstances, but we must apply those convictions amidst the pressures of the day. We compromise all the time: Shall we see our child’s basketball game or shall we go to the meeting at work? It is necessary to spend time with one’s children, and it is necessary to earn and provide for them. Our ends come into conflict all the time. Statesmen are people unusually adept at finding ways to get the best and avoid the worst, and constantly they adapt and compromise. Constitutions on the other hand are grand laws written a long time ago. They get in the way all the time, and statesmen constantly have reasons to be impatient with them. Any list of the most influential heads of state in the 20th century has to include the names of Hitler, Stalin, and Mussolini. They are not famous for their constitutionalism, but for being tyrants. The greatest opposite example in the 20th century is found in the remarkable career of Winston Churchill, which I have been privileged to study. The British Constitution, and for that matter the American, are among his favorite themes. He served them faithfully through his more than 50 years of active political life, through war such as has never been seen, and also through unprecedented economic depression. These two solutions, constitutionalism and statesmanship, come together then in the careers of certain remarkable people. On the one hand they are good at getting power, and on the other hand they are quick to give it back and to set examples that serve to distribute power long after them. One need think only of George Washington and his repeated resignations from office just at the moment when he had gained such credibility that some called for him to become king. If you want to see a contemporary example, watch the victory speech of the newly-elected U.S. Senator from my home state of Arkansas, who spoke of the need to find ways for our government to address our many problems, including those of the poor and the weak, while still running the government under the Constitution so that the people can control it, and not it the people. Although we have plenty to worry about in the management of the College that stems from these great trends, still we see reason to hope for more waves in the direction of the Constitution. Our crisis may be grave and threatening, and yet it cannot be worse than others we have survived in the past. Those others can supply a guide to us today. And just like the pursuit of wisdom, so the life under free and constitutional rule is a beautiful life, and it sings to the heart of every man and woman.